CloudMile helps you to turn AI excitement into real impact. Through the experience of cooperating with more than 200 customers, CloudMile summarize that most of business which had successfully adopt AI solutions for real business impact have the same characteristic: the desire of integrating business logic with machine learning with an agility mindset. 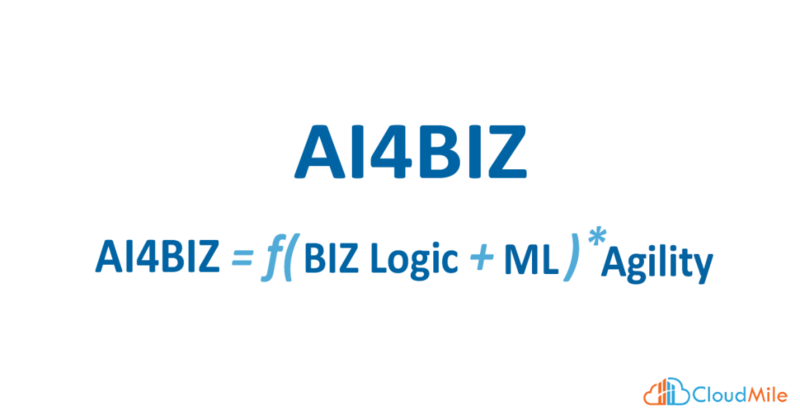 This characteristic, leveraging AI solution to achieve advance digital transformation and improve business objectives, we called it AI4Biz. Based on our experience, AI for business is built on 3 main pillars – people, process, product. What means that only when 3 key elements are ready, we can talk about truly AI driven transformation with all that benefits and advantages of data-driven operation. ● The readiness and iteration of data, and ml. First of all, people, includes talent acquisition and data-driven concept. To successfully adopt AI solution, especially machine learning, in a business, you need not only data scientists, but also data engineer, machine learning engineer, and software engineer. In addition, everyone in the cooperation has to embrace data-driven concept. The actual “Data-Driven” meaning is to determine by or dependent on the collection and analysis of data. In the era of AI, meaningful data has a broader range than the era of Big Data. It not only consists of structured data but also image, audio, signal, video, and text, because AI creates the opportunities to measure and analyze anything human can think of. Anything actually means for everything, including the future. The actual Data-Driven meaning is to determine by or dependent on the collection and analysis of data. In the era of AI, meaningful data has a broader range than the era of Big Data. Second, process, it includes the transformation of people’s mindset, transformation of current business process and also AI solution’s process. To make it simple and organize, we would like to introduce data-driven design thinking concept. Many business claim to embrace AI solution but do not actually understand what it means to adopt AI solution. Businesses do not realize that the process of adopting AI solution, is exactly the same as design thinking process, a well structured innovation process, defined and practiced for more than 10 years. Last but not least, product. The key concept is to generate an organic cycle of product, user, and data. Based on our observation, there are 2 scenarios of how business trying to leverage AI solutions’ benefits and advantages as a product. One is having a machine learning model and trying to find the business model out of it, and another one is to integrate machine learning model to enhance or enrich current products or services. However, we think there is an unified concept of how AI for business shall be initiated. A practical way to have a successful AI product shall find the business objective first, then practice machine learning coordinately. More importantly, a successful AI driven product shall attract users to generate data for its improvement needs.